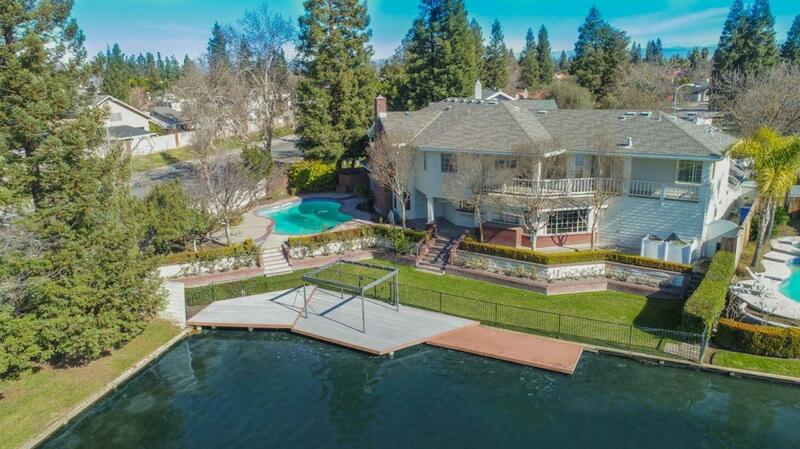 This traditional family home is located on the water at Woodward Lake. Feel like you are on vacation every day, while you enjoy time boating on the lake or relaxing poolside and taking in the view. As you step inside this wonderful custom home you are greeted by a grand fireplace that is the central focus of the great room. The kitchen features double ovens, two dishwashers and gorgeous granite counters. There is flexibility in the floor plan and a bonus room that can be used for anything you desire. The master suite has a private balcony, two closets and his and her private offices. Master and 3 additional bedrooms upstairs, 1 isolated bed and bath down. This fantastic home has everything you are looking for: great location, updated and CUSD! Listing provided courtesy of Danyelle Conner of London Properties, Ltd..
© 2019 Fresno Multiple Listing Service, Inc. IDX information is provided exclusively for consumers' personal, non-commercial use and may not be used for any purpose other than to identify prospective properties consumers may be interested in purchasing. All data, including all measurements and calculations of area, is obtained from various sources and has not been, and will not be, verified by broker or MLS. All information should be independently reviewed and verified for accuracy. Properties may or may not be listed by the office/agent presenting the information. Data last updated: 2019-04-24T15:46:50.333.